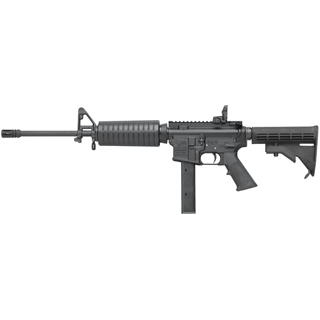 Colt AR6951 AR-15 Carbine 9mm 16.1 32+1 MT Semi-Auto Blk Rogers 4-Pos Stock in. The Colt 9mm Submachine Gun SMG is exceptionally wellsuited for law enforcement organizations requiring a lightweight compact highlyconcealable select fire weapon system for close confrontations. It is constructed with a modular rail system that allows for the easy mounting of ancillary devices fires from a closed bolt has a collapsible buttstock and is easily fieldstripped without the need for any special tools. The straightline construction coupled with the low recoil of 9mm ammunition provides highly accurate fire with less muzzle climb especially in full automatic fire. Less recoil also facilitates ease of training and improves accuracy. The effective range of the Colt AR6951 is 100 meters.